Chevy is certainly known for its dependability, and this sentiment was recently confirmed by an array of accolades. Specifically, four of the brand’s popular models earned J.D. Power’s dependability awards, and Chevy was recognized as the lone manufacturer to earn the award for a truck, car, and SUV. Perhaps even more impressively, the brand accomplished this feat for the second straight years. 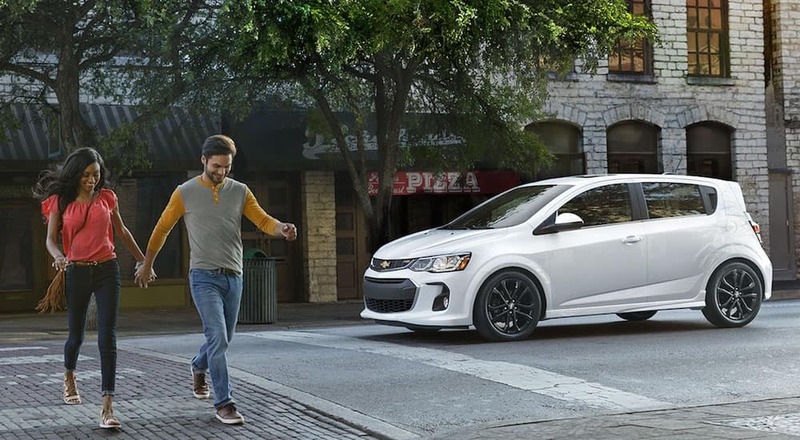 Considering the relatively small stature of the 2017 Chevy Sonic, drivers probably aren’t expecting all that much power. However, the engineers did an admirable job of assuring that their assortment of engines is capable of cranking out a respectable amount of muscle. The ECOTEC 1.8-liter four-cylinder engine manages to pump out a respectable 138 horsepower and 125 pounds-feet of torque, while the alternative ECOTEC 1.4-liter Turbo engine delivers 138 horsepower and 148 pounds-feet of torque. There are certainly more powerful options on the market, but consumers still shouldn’t assume that the vehicle isn’t capable of delivering some power. However, where the vehicle truly earns its “dependability” moniker is via the engine’s fuel efficiency. The ECOTEC 1.8-liter four-cylinder engine is able to deliver an impressive 33-mile-per-gallon highway fuel efficiency, while the ECOTEC 1.4-liter Turbo engine boosts those specs to 38-miles-per-gallon on the highway. You’ll already be saving yourself a chunk of change by pursuing the Sonic over a pricier model, and you’ll also be able to save some additional money at the gas pump. While the Sonic’s dependability can be attributed to the efficiency, we’d say the Camaro’s dependability is attributed to the power and performance specs. The model is classified as (in J.D. Power’s terms) a “sporty” car, and the three available engine options certainly confirm this notion. The 2.0-liter Turbo engine may be the smallest of the Camaro’s offerings, but you shouldn’t let that fool you. The system can ultimately deliver an incredible 275 horsepower and 295 pounds-feet of torque, leading to a 0-to-60 time of 5.4 seconds when equipped with the manual transmission (5.5 seconds with the automatic transmission). Despite all of this power, drivers can also anticipate a respectable 31-mile-per-gallon highway fuel efficiency. The next engine is the 3.6-liter V6, which manages to crank out 335 horsepower and 284 pounds-feet of torque. These specs also lead to impressive performance numbers, as the accompanying eight-speed automatic transmission helps the vehicle achieve a 5.1-second 0-to-60 time (5.2 seconds on the manual). Finally, the 6.2-liter V8 engine is the most hulking of the bunch, delivering an unmatched 455 horsepower and 455 pounds-feet of torque. These specs have the most drastic impact on performance, as the Camaro can hit 60 miles per hour in only four seconds (4.3 seconds when equipped with the manual transmission). 14,800 pounds when equipped with the 6.0-liter V6 engine and these numbers are elevated to 18,100 pounds when buyers opt for the Duramax 6.6-liter Turbo-Diesel engine. Meanwhile, the 3500HD can haul 14,600 pounds with the Vortex 6.0-liter V8 and 23,300 pounds with that previously-mentioned Duramax engine. The brand also added a number of mechanical amenities that will make it a whole lot easier to tow any cargo or trailer. The Trailer Sway Control assures that the cargo will remain on the same path as your pickup, preventing any unintended swaying. If your trailer is going a bit awry, you can view the unit (as well as the accompanying cargo) via the brand’s clever Trailering Camera System. Finally, the Diesel Exhaust Brake System is perhaps the most appreciated inclusion, as the unit will provide the driver with the ultimate stoppage power. The Tahoe is a large SUV, making it an ideal choice for families. Well, if you are going to constantly be traveling with younger passengers, you’ll surely want the vehicle to deliver dependable safety functions. Predictably, the 2017 Chevy Tahoe delivers in this regard. The vehicle is equipped with a number of clever technologies that should help drivers avoid accidents altogether. For instance, the Low-Speed Forward Automatic Braking and accompanying Forward Collision Alert can determine when a front-end crash is imminent. After altering the driver via audible and visual cues, the vehicle can automatically apply the brakes to prevent a collision. If those warnings tend to be too distracting, drivers can activate the Safety Alert Seat, which will notify the driver of any danger via a slight vibration. Meanwhile, the Rear Cross Traffic Alert can determine when an object is about to suddenly cross your vehicle’s path, and the Rear Park Assist will help guide the driver into a pesky parking space. The SUV even includes a Rear-View Camera, meaning you’ll be able to monitor everything that’s happening behind your Tahoe.